"A new crisis is arising in the Korean Peninsula." Apparently, based on the same seismographic blip that revealed the test in the first place, there are some serious questions about whether the bomb is a hydrogen bomb at all. Good to see that they're still k00Ks though. When the U.S. finalizes their 60 year plan to invade DPRK for their daikons, they'll be ready. Or if it was one, it didn't work, and only the fission primary went off. It would be kind of disrespectful to say they just faked it; we don't want them to unleash their powerful arsenal on us, after all. The Obama administration has refused to take part in six-party talks sponsored by China to resolve the NK nuclear issue, until Pyongyang accedes to US demands in advance. The Korean Peninsula is just one of the dangerous flashpoints that the Obama administration has deliberately stoked up as part of its 'pivot to Asia.' The US is tranforming the whole region into a tinderbox..."
we don't want them to unleash their powerful arsenal on us, after all. They're number 50, in terms of population, but have the world's fourth largest military. So the question, for all Canadians, should be "how well can they swim?" And honestly, if DPRK had sufficient troop ships to get their whole army to our shores, I think our biggest challenge would be dealing with the massive number of defectors. It would make all of the Syrian refugees look like one family overstaying their vacation Visa. Does N Korea Need Nukes to Deter US Aggression? Just as ISIS emerged from the embers of the Iraq War, so too, nuclear proliferation on the Korean peninsula is a direct result of failed US foreign policy in the '50s. How can the North normalize relations with the US if Washington won't talk to them and at the same time, insists that the North abandon the weapons programs that is their only source of leverage?" DPRK announced the development of its first primitive nuke 7 years ago. If the U.S. were hellbent on invading DPRK for their daikon, surely they'd have done so, say, 8 years ago? When DPRK had no nukes, and GW was still the Head Cowboy? "With extreme recklessness, the Trump administration is charting a course toward war in the Asia-Pacific. From the response in the US media and political establishment, however, one would have no idea how dangerous the situation is, nor how incalculable the consequences. If words have any meaning, the statements from Tillerson and Trump make clear that the US is preparing 'pre-emptive' war, justified by North Korea's reported plans to test an intercontinental ballistic missile (ICBM) capable of reaching the continental United States. There is a staggering disconnect between the terrible consequences of such a war and the way it is being treated in the US [and Canadian!] media. Tillerson's comments were greeted with a shrug on the network news programs Saturday evening. The Democrats have remained silent. A war is being contemplated that could lead to the first combat use of nuclear weapons since the end of World War II..."
There's just an unspoken acceptance of the legitimacy of the US doing things that, official enemies are not allowed to do..."
"One has the feeling that a conflict could break out at any moment. If a war occcurs, the result is a situation in which everybody loses and there can be no winner.."
"Now consider what the US media don't tell you about Korea..."
From "Moon of Alabama -- where barflies get together". Think I'm just making that up? Go ahead and click, and get edjumacated, Alabama bar-style. NDPP style! I gather the article was not to your liking or is it only the blog author's sense of humour you object to? Hard to tell which it was but it felt like a drive-by whine. Are you sitting on y0ur stapler or something? For the record, the Moon Of Alabama site is named for a line in the Bertolt Brecht song Whiskey Bar(popularized by the Doors), which in turn was the name of the the webmaster's original site on DailyKos. Though its political slant seems less Brechtian, and more isolationist Right(basically, alt-right in the current parlance). When Trump won last November, they posted a piece hailing his victory, and denouncing Democrats as "Manhattan party-goers" who only care about supposed trivialities like the rights of transgendered teenagers. "...On Friday, Chinese Foreign Minister Wang Yi warned 'conflict could break out at any moment.' Pyongyang considers Trump 'unpredictable'. China is Pyongyang's key ally. In 1961, both countries signed the Sino-North Korean Mutual Aid and Cooperation Friendship Treaty. It obligates both nations to provide military and other aid if either one is attacked by a foreign power. The treaty remains in force until 2021. It's Trump's call. His belligerence over diplomacy is great cause for concern." "She underlined her close relationship with Tillerson, who she said was grateful to have Canada's support for the Syria airstrikes." Sino-North Korean Mutual Aid and Cooperation Friendship Treaty. It obligates both nations to provide military and other aid if either one is attacked by a foreign power. The treaty remains in force until 2021. They've got their own NATO! That's adorable. Breaking news Magoo learns about 55 year old treaty. If I'm a few days late to the party, it's only because nobody whines about this treaty organization when they're whining about NATO and how awful it is. Not to throw shade on the Sino-North Korean Mutual Aid and Cooperation Friendship Treaty. If DPRK is a signatory, I'm sure they only want to keep the peace. How many countries did the signatories to this treaty bomb last year, in the last decade or over the course of 55 years. Now do the same thing for NATO. Your moral equivalency argument is absurd like many of your comments. How many countries did the signatories to this treaty bomb last year, in the last decade or over the course of 55 years. Did you literally Google "China imperialism" to get the quirky number of "55 years"? I just did simple math from the date the Treaty was signed. It will be 56 years later this year. You can celebrate it on the same day as you celebrate Canada Day. With Trump's Russian connections he has the potential to reduce tensions in several of our planet's hotspots. Hopefully he does just that. That worked really well in Syria. Losing Seattle and Portland would doubtless make a very effective "Reichstag fire." Unfortunately an attack on North Korea would bear a strong analogy to the attack on Poland. The Chinese leadership does not bear much resemblance to Munich-style "tea-swilling old women" and "little worms". One hopes that Mr. Trump pays that much attention to reality. Well, for once we can set the "Doomsday Clock" back a second or two. To be fair, I do find Trump's sabre rattling a bit unsettling. But also to be fair, we haven't even had the "first 100 days" of Trump's bluster, but we've enjoyed DPRK's sabre rattling for decades. "It's easy to dismiss Kim Jong-un as a madman. But there's a long history of US aggression against the North which we forget at our peril. History doesn't matter, until it does - when it rears up and smacks you in the face." It's easy to dismiss Kim Jong-un as a madman. It's not unreasonable to suggest that the (ongoing) geo-political climate on the peninsula and in the region explains much of DPRK's militarization, including their nuclear weapons program. But what's supposed to explain the autocratic, dynastic "Emperor" government and all of its associated weirdness? I think most folk outside of Korea would have a much greater understanding of all of this, and much more empathy for DPRK, if they (for example) had a democratic government of some sort, some personal freedoms, and suchlike. But the whole "Dear Leader/Great Leader" silliness is kind of baked right in with the legitimate stuff so it's hard to know whether Kim (whichever one you wish) is building nukes to respond to a legitimate threat, or because he's out of his fern. Their eclectic system of government aside, if the biggest military in the world has a practice war on your doorstep on a regular basis I think it would make any country explore its range of military options. I think it would make any country explore its range of military options. Sure. I think I said exactly as much. But I was hoping someone could explain everything else. What you euphemistically refer to as their "eclectic" government and such. "Whether a nuclear war breaks out within the next few days or not - the despicable fact remains, that the entire world is being held hostage by American military madness. It seems only a matter of time before the US finally triggers a war with any number of foreign states that it designates as 'enemies'." "We burned down just about every city in North Korea and South Korea both...We killed off over a million civilian Koreans and drove several million more from their homes. 32,357 tons of napalm dropped on Korea. More bombs than Pacific Theater in WW2. 'Biblical' devastation resulted. A slaughter such as I have never heard of." I wish I could provide an answer. While I have extensive work experience with South Korean companies and employees and could offer opinions about the foibles of their society, I have no idea how that relates to North Korea. "There is no country in the world that needs nuclear weapons more than North Korea..."
CHRISTINE HONG: You know, I think what we’re witness to is a kind of revisionism, both with Vice President Pence and Secretary of State Tillerson. They’ve made comments that Obama’s policy of strategic patience is a thing of the past. And I think that that fundamentally misconstrues what the nature of strategic patience was. You know, as you mentioned in your opening description, Obama waged a campaign of cyberwarfare against North Korea. And so, you know, far from being a kind of kinder, gentler or even softer policy toward North Korea, Obama’s policy toward North Korea was, in point of fact, one of warfare. The other thing that I would mention with regard to this is, even the possibility of military action against North Korea, a military option, if you will, that’s—that was—it would be inconceivable, if the Obama administration hadn’t made the militarization of the larger Asia-Pacific region one of its topmost foreign policy objectives. And under the Obama strategic pivot to the Asia-Pacific region, the U.S. concentrated its naval forces to a tune of 60 percent—to 40 percent in the Atlantic—in the Pacific region. And so, you know, right now we have the situation in which the [Trump] administration is stating that all options are on the table. And I would want to remind your listeners and viewers that the United States performs the largest war games in the world with its South Korean ally twice annually. And in the course of performing these military exercises, it actually rehearses a number of things. It rehearses the decapitation of the North Korean leadership, the invasion and occupation of North Korea, and it also performs a nuclear first strike against North Korea with dummy munitions. And so, we have as one of the possibilities a nuclear—a preemptive nuclear strike against North Korea. That is the nature of the unhinged foreign policy that we’re seeing on the part of the Trump administration. I would also say that even though North Korea and Kim Jong-un serves as a convenient foil, a kind of bad guy for U.S. foreign policy within the larger Asia-Pacific region, we have plenty of reason to be frightened of Donald Trump’s America-first foreign policy, which doesn’t serve Americans, much less anyone else around the world. CHRISTINE HONG: Well, I think that we should all be mystified that successive U.S. administrations in the post-Cold War period have attempted to outsource their North Korea policy to China, as though the United States and China maintain the same strategic interests within the larger Asia-Pacific region. You know, Bruce wrote a piece, which you mentioned in the opening, in The Nation, and he pointed out that North Korea recently timed one of its missile tests to coincide with Trump’s dinner with the Japanese prime minister, Shinzo Abe, and that this missile was figuratively aimed at Mar-a-Lago. More recently, Donald Trump also responded in kind. So it’s not simply his tweets that we have to attend to. It’s these like dumb shows that he’s putting on during dinner. He was having a meal—many people reported this—of dry-aged steak and chocolate cake with Xi Jinping. And, you know, over this beautiful piece of chocolate cake, as he described it, he let Xi Jinping know that he had struck Syria with approximately 60 Tomahawk missiles. And, you know, I can only imagine that this must have been indigestion-inducing, indeed. And, you know, the message seems to be pretty straightforward. The message is, you know, "China, you either rein in North Korea, or the United States will take unilateral action." But I think that there’s a deeper subtext to this, as well. And it goes to the question of THAAD. You know, there isn’t—there’s no way that China and the United States are going to see eye to eye on the controversial deployment of THAAD, which China understands as encroaching upon its sovereignty and enabling the United States to peer, in terms of surveillance, into its territory. Even a CIA official, a former CIA official, Bruce Klingner, who’s a Heritage Foundation North Korea watcher, he basically stated that China regards THAAD as a dagger that’s aimed at the heart of China. And so, you know, basically, what you have is the United States attempting to get China to rein in North Korea, but the fact of the matter is, is if you even look back to the previous administration, the Obama administration, every single weapon sales, every single acceleration of the THAAD missile defense system into the Asia-Pacific, every single amplified and ratcheted-up war game with various different regional allies was justified in the name of a dangerous and unpredictable nuclear North Korea. But China understood full well what was happening, which was the encirclement of China. So North Korea has served as a very convenient ideological ruse for the U.S. military-industrial complex, when the real target is China. JUAN GONZÁLEZ: Bruce Cumings, professor of history at the University of Chicago, you have raised the issue that the media treats every—every crisis with Korea separate and apart from the previous crises that have occurred. Could you talk about that? BRUCE CUMINGS: Well, that’s right. It’s not only that, but each crisis is treated as if it has really no background. The fact is that American nuclear intimidation of North Korea goes back to the Korean War. After the Korean War, in 1958, we installed hundreds of nuclear weapons in the south, the first country to bring nuclear weapons onto the peninsula. And North Korea has, essentially, since the late 1950s, had to find a way to deter the U.S. from using those weapons. For decades, they built underground. They have something like 15,000 underground facilities of a national security nature. 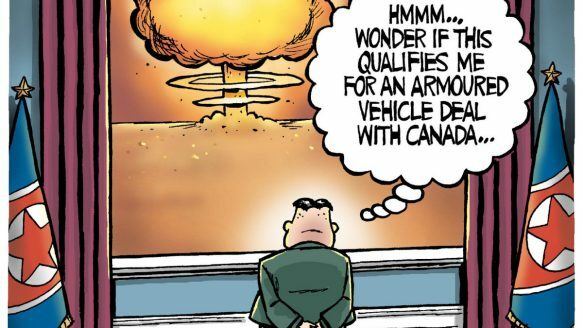 But it was inevitable that when threatened with nuclear weapons—and Chris is right: President Obama threatened North Korea with nuclear weapons many times by sending B-2 bombers over the south, dropping dummy bombs on islands and so on. It was just inevitable that North Korea would seek a deterrent. And what is, to me, so insane about this—particularly this last weekend, when somebody purposely leaked to NBC that the U.S. was considering a preemptive strike, but what’s so terrible about it is that you essentially get a standoff, with North Korea having nuclear weapons, the U.S. having nuclear weapons, but North Korea not being able to use them anywhere without being turned into a charcoal briquette. That was General Colin Powell’s reference to what would happen if North Korea launched a nuclear weapon in anger. So, somehow, I think the Trump administration quite purposely ratcheted up the tension. A week ago it was talk of assassinating Kim Jong-un; this weekend, talk of a preventive strike. I don’t think Vice President Pence is right that what President Trump has done shows strength and resolve. It’s one of the easiest things to fling 59 cruise missiles into Syria. Apparently, the military has wanted to test this MOAB, "Mother of All Bombs," for some time, and it went ahead and did it. It’s not clear what the outcome of either strike is. And it seems that Mr. Trump, who ran on an anti-interventionist platform, is actually enjoying the toys that the military can provide to him, and perhaps using them in Korea, which would be a complete disaster. The leader of North Korea, it goes without saying, is reckless -- and now more than ever. Is he intentionally provoking Trump to attack North Korea? I doubt it. He's probably hoping to get some sort of concessions out of the US and/or the South. At the very least, have an ex-president heading over there to negotiate something, like Carter on a few occassions starting in 1994, and Clinton a few years back when those two American reporters ran in from China and got themselves hauled into prison. It should also be read into the record that candidate Trump in 2016 expressed a willingness to meet with the DPRK leadership, something which jibed with North Korean demands, and which no sitting POTUS(to my knowledge) has ever done. The North responded by endorsing Trump for president. He's definitely "acting out", as a child psychologist might say, but if Trump were to attack tomorrow, I certainly would not absolve him on the grounds that he "was provoked". I think Trump is realizing how much fun it is to play Risk, but with real-life gamepieces. He's definitely "acting out", as a child psychologist might say, but if Trump were to attack tomorrow, I certainly would absolve him on the grounds that he "was provoked". Did you mean to say that you "wouldn't absolve" Trump? That seems to fit more with what comes before and after the passage in question. ..am i in the twilight zone? who is doing the provoking? After the Korean War, in 1958, we installed hundreds of nuclear weapons in the south, the first country to bring nuclear weapons onto the peninsula. Did you mean to say that you "wouldn't absolve" Trump? I'm reminded of so many Hollywood movies. Hacker leader: We have exactly seven seconds to decrypt the 2048-bit password before it's too late. Hacker nerd: Aaaaand... we're in!! The US Pushed North Korea To Build Nukes: Yes or No? "So the question is: What do we do now?" "Here's an idea for cooling the nuclear tensions between North Korea and the United States. Why not start by negotiating an end to the Korean War? With Donald Trump as US president, that war is in danger of reigniting..."
Perhaps no country on Earth is more misunderstood by Americans than North Korea. Though the country's leaders are typically portrayed as buffoonish, even silly, in fact they are deadly serious in their cruelty and skill at retaining power. Though the country is seen as Soviet-style communist, in fact it is better understood as a holdover of Japanese fascism. And there is another misconception, one that Americans might not want to hear but that is important for understanding the hermit kingdom: Yes, much of its anti-Americanism is cynically manufactured as a propaganda tool, and yes, it is often based on lies. But no, it is not all lies. The US did in fact do something terrible, even evil to North Korea, and while that act does not explain, much less forgive, North Korea's many abuses since, it is not totally irrelevant either. devastating the country far beyond what was necessary to fight the war. But evidently, far less than what was necessary to win it. Or else how did it end in an armistice rather than a victory? It's pretty hard to call it "overkill" if it wasn't even enough. Technically, the war that began in 1950 when Pyongyang invaded South Korea is still ongoing. So this fight began when the skinny kid smashed his glasses on the big bully's fist? Or what? The situation is all America's fault how again?? ..just like they did in vietnam. the us does this overkill often as a tactic (bombing them into the middle ages) and this includes spliting a country.